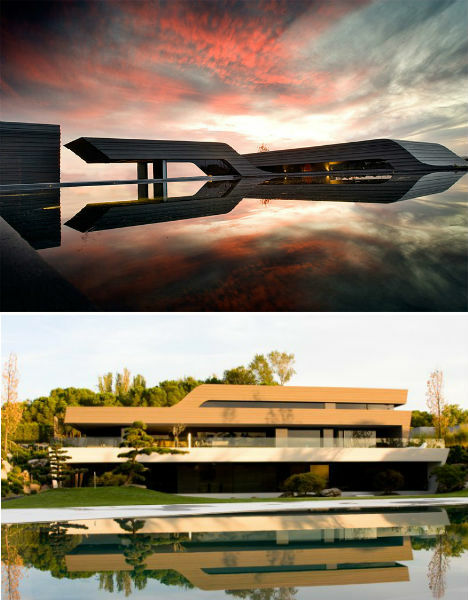 Spanish architecture firm A-cero is known for its striking modernist villas in its home country, as well as a growing body of international work. Influenced by contemporary sculpture, A-cero’s residences are sprawling arrangements of geometric shapes, curves and ramps in stark white, gray and black marble and concrete. Here are 12 of the firm’s most impressive private homes, including a high-end apartment renovation. 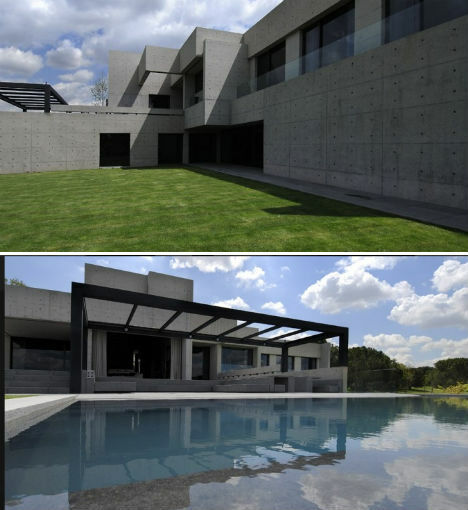 Inspired by the modern works of Spanish sculptor Jorge Oteiza, A-cero’s Open Box House on the outskirts of Madrid consists of textured, angular concrete shapes complimented by the simplicity of a Japanese garden. 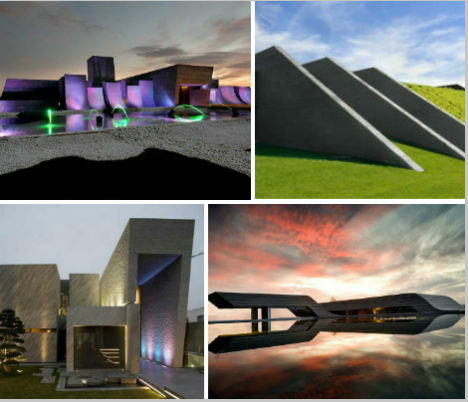 The dramatic entrance includes bright, colorful LED lights set into the floor, and surrounding the home are several reflecting pools with geometric stepping stones. A single-story house doesn’t have to be less visually interesting than larger, multi-story residences. 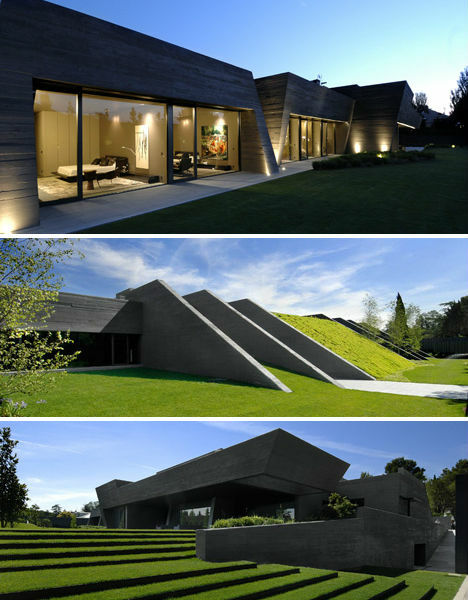 A-cero gave this low-lying home near Madrid concrete ‘fins’ that are occasionally filled with soil and planted with grass, creating slopes that lead up onto the roof. 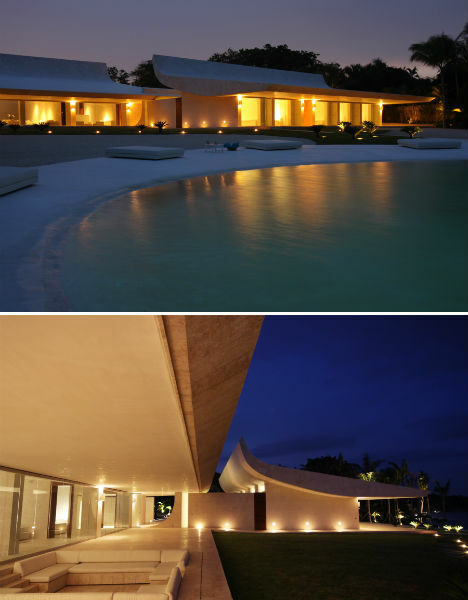 A-cero’s ‘Home in Somosaguas’ almost looks like a massive house boat from the side, especially when seen adjacent to a large reflecting pool. Stacked, staggered horizontal shapes create interior living spaces as well as outdoor terraces and a rooftop pool. Perhaps among the most unusual homes of the last decade, A-cero’s 1001 Nights House in Madrid features sloping outdoor surfaces that resemble skate ramps. 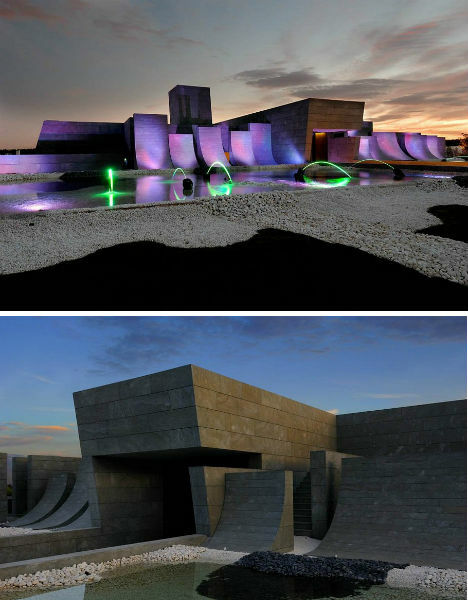 The architecture firm brings out the colored LED lights to an even more dramatic effect, highlighting the curves and geometric forms as well as pools of water in white stone beds. Perhaps one of A-cero’s most conventional-leaning creations, Memory House fits into its suburban surroundings while maintaining the firm’s signature sculptural style. 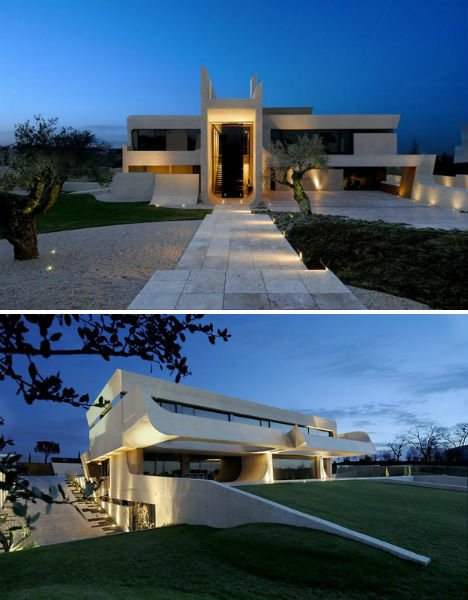 The three-level home features an exterior made of white marble, bamboo and a combination of angular and curving shapes. Though from most angles, this home looks unlike most other residences in the Dominican Republic, the sloping shapes of the roof greeting the pool in the back yard are suggestive of more traditional beach huts. 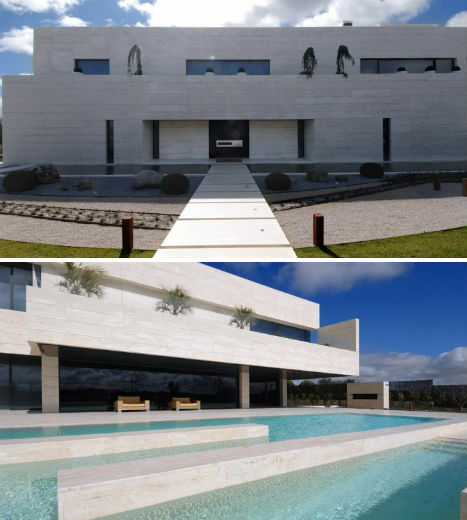 The home is made of an indigenous stone that pays tribute to the seaside location and also reflects lots of light within both exterior and interior spaces. Working with a difficult sloping home site, A-cero crafted a luxury residence with staggered levels that enable sweeping views of the Mediterranean Sea. The main level includes a large rectangular pool, and just above it is a first-floor bedroom with floor-to-ceiling glass windows and doors. 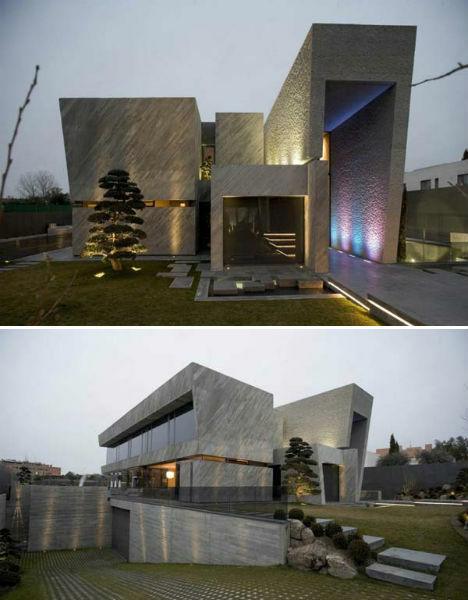 Completed in 2006, the Concrete House (I) is a contemporary residence in Pozuelo de Alorcón, Spain. The solid-looking home is pierced by a number of unexpected hallways, courtyards and other voids, and decorated along the exterior by architectural projections like a black pergola extending out to the swimming pool. 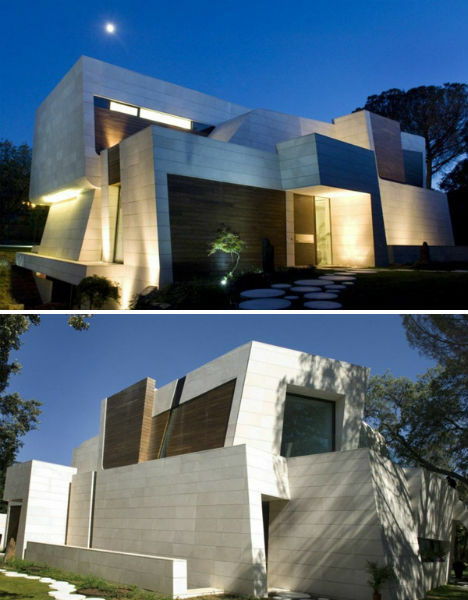 Straight lines and simple shapes dominate this Madrid house, made of Travertine marble. The combination of all the white, large windows and built-in lighting give it a light feel despite the heaviness of its materials. This home stands out among A-cero’s accomplishments simply because it’s not solid white, but rather a beautiful contrast of black and white marble. 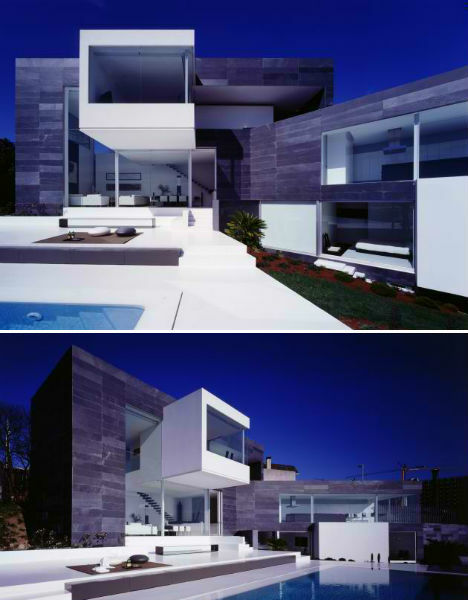 The L-shape of the house was determined by a triangular, sloped site, with the interior angle opening to a view of the estuary of A Coruña in Spain. A-cero’s structures are so dazzling, it’s hard not to get caught up in the exteriors and forget about the interiors all together. But this apartment renovation in Galicia, Spain is one example of how the firm can infuse a space with its particular brand of aesthetics. 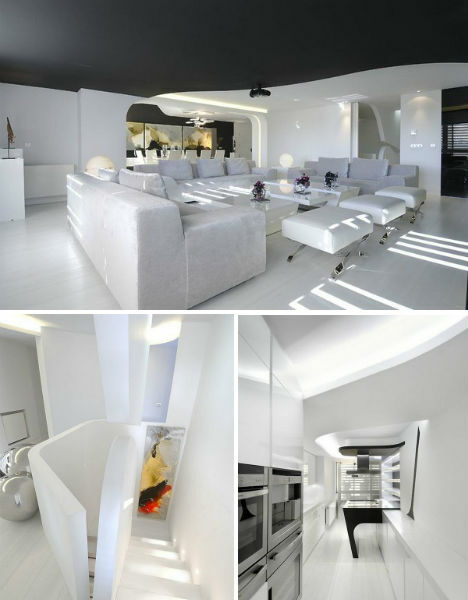 Of course, the apartment is full of high-contrast colors and materials as well as lots of curves and geometric shapes.